The cliche among people who have children with special needs is that our most fervent wish is that we will live one minute longer than our children, just long enough to ensure that someone has been at their side as a fierce advocate every moment of their lives. ‘For most of us, it will not happen that way. But it’s still something we think about, especially when crimes like the one captured on video last week, allegedly in a West Side apartment, are committed against our children. Yet while acts like these are thankfully rare, the obstacles that people with disabilities face are not limited to crime. When our son was born, it was a battle to convince a string of pediatricians that something was wrong. Getting a referral to some wonderful physicians at what is now Lurie Children’s Hospital of Chicago was relief beyond belief. A diagnosis was given — developmental disabilities resulting from hypoglycemia and seizures — and a plan of treatment was enacted. School bus rides began at the age of 3, for several kinds of therapy. We lived in an elementary school district where mainstreaming and inclusion was the norm. That enabled other children to accept our son as just another kid. But then came the teen years and the transition to a high school district that housed special-needs kids in a special-education classroom all day with little interaction with so-called “normal” children. So we fought again, especially my wife, who spent virtually every waking moment with him, and knew our son’s potential. At one meeting, educators asked her, “What are your son’s limits?” Her steely reply: “The sky’s the limit.” Our son got some art classes, and we fought for behind-the-wheel driver’s education. He passed the test for his license at the DMV without any problem. But who wants to hire a special-needs young adult unless it’s simply to push shopping carts? Not many. So, another battle. And, eventually, another victory. Our son has worked hard on his own as well. The high school that wanted special-needs students to stay hidden away? Our son became co-captain of the track team. When he was 3 or 4, we didn’t know if he would ever walk or talk normally. Now, he has trained ceaselessly to become one of the fastest Special Olympics sprinters in the country and gives speeches for Special Olympics as well. Most parents advocate for their children, whether they have disabilities or not. But our battles don’t end at a certain age. 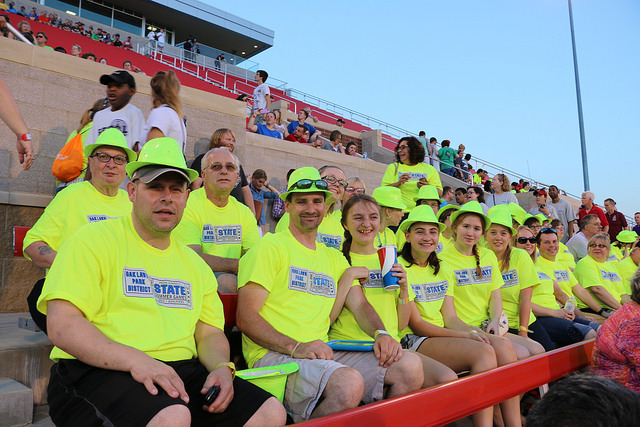 We see parents in their 60s and 70s faithfully attending their middle-age children’s sporting events in Special Olympics, enjoying the moment, yet always uneasy about how their child will fare without them. Social media has heightened our unease. We want our children, as best they are able, to make friends and develop a life of their own. Who can be trusted? “You’re meeting Ron at the park to play basketball? Who’s Ron?” Criminals tend to pick on the weak and the vulnerable, as allegedly occurred on the West Side. And when you’ve expended every spare dollar and every last breath to enable your child to have the most “normal” life possible, crimes like these are even more tragic. Let’s be clear, too, not to paint all special-needs people with the same brush. They come in all colors, shapes, sizes, personalities and IQs. Down syndrome is not the same as autism, which is not the same as other developmental disabilities. Special-needs young people can be kind and loving and generous; they also can be selfish or rude at times. People are people. Our son functions at a fairly high level. Not all do. Yet all functioning levels have their own benefits and challenges. The alleged perpetrators in this case evidently committed vile, cruel and evil acts. So, too, do those who try to politicize this crime and use it to advance racism. I have African-American friends who would give their lives to save my son’s life if it came down to it, and I would do the same for their children. As long as there are humans, there will be evil. But how can we incorporate people with special needs into the all-encompassing diversity we need in this world? The inclusion my son experienced in grade school and middle school is a good place to start. So, too, is a fairly new concept from Special Olympics called Unified Sports. In these sports, ranging from soccer to volleyball to speed skating, people without disabilities play on the same teams as those with special needs. They befriend each other and learn that people with disabilities are not so different after all — that they are worthy of respect, acceptance and love. Yet it does not help when governmental entities, like the state of Illinois, target funds for the disabled as a prime place for budget cuts. It does not help when the state of Texas shamefully guts its special-education program. And it surely does not help when congressional leaders make threats to fundamentally alter Medicare, Medicaid and food-stamp programs. Yes, the disabled rely on these as well, and never so much as when their parents have passed away. It is said that the true measure of a society is how its treats — and values — its most vulnerable citizens. People with special needs are surely near the top of that list, and their numbers swell every year. In the speeches that our son shares around the Chicago area, he makes the point that, “If you think about it, we all have special needs in one way or another. Some are just more obvious than others.” What are mine? What are yours? And how can we reach beyond them for love and understanding? May those questions resonate in our hearts long after the video of what happened in Chicago becomes a fuzzy memory. And may the young man who was attacked last week discover soon — and often — that the people who care about him outnumber the sadists exponentially. Patrick Kampert is a Chicago writer and a former Chicago Tribune editor and reporter.